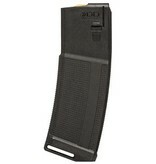 Carbon Fiber Reinforced Polymer Magazine. Improved feed lip design for optimized feeding and reliability. Textured surfaces for enhanced grip. Impact absorbing baseplate design. Enhanced anti-tilt follower. Easy to disassemble. Non-snag design. Patent pending. Made in the USA.